Wat Yannawa is an old Bangkok temple built during the Ayutthaya period. 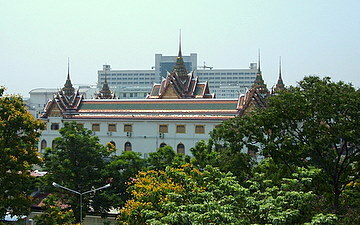 It was originally called Wat Khok Kwai or buffalo stable. In the reign of King Rama I (1782 - 1809) the temple was designated a royal temple and renamed Wat Khok Krabue, which is still a stable for buffaloes though of a slightly different species. 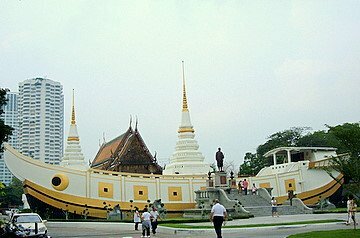 In the reign of King Rama III (1824 – 1851) a Chinese junk, a vessel responsible for prosperous trade between China and Thailand during that period, was built in the temple grounds. 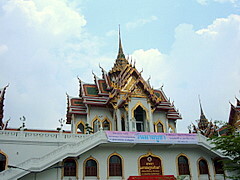 The temple was then renamed Wat Yannawa. 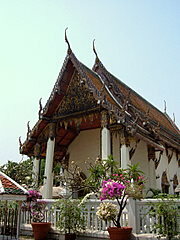 Yan in Thai means craft or conveyance and nawa, vessel or boat; hence this wat is sometimes referred to as the boat temple. 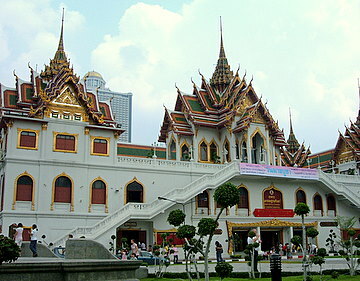 Here are some photographs of this Bangkok temple with a very unusual structure. 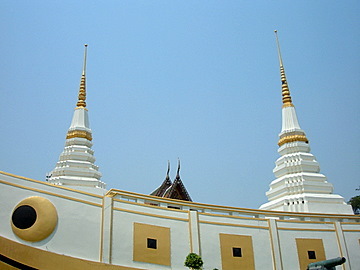 The two chedis on deck represent the masts and the altar to the rear, the wheel house. Because of this, the locals call the temple “sampao chedi” or the Chinese junk with chedis. The huge Chinese junk obscures the view of the bell tower and ubosot to the rear. There’s district nearby also called Yannawa. 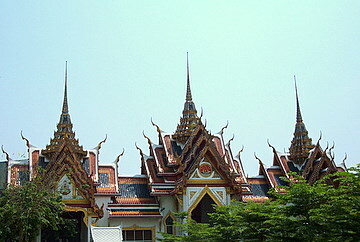 But the district in which this temple is located is named Sathorn instead. The area is still very Chinese judging from the neighborhood Chinese shrine and the Chinese and Thai signboards in the shops. Here are some of the other buildings within the temple grounds. Little is written about this temple. It’s rarely visited by foreign tourists even though it’s within walking distance from the Taksin Bridge skytrain station. Most of the sightseeing is done by local visitors. In 2007 Wat Yannawa got into the news but for very different reasons. Here’s the story. 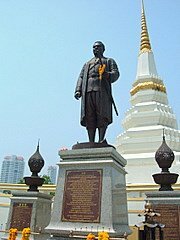 The Wanglee family in Bangkok is an old Chinese family that dates back to the reign of King Rama V (1868 – 1910). In 1926, the family built a row of houses based on the designs of a French architect. These old two story shop houses are located in Soi Charoen Krung 52 or Soi Wanglee near the Chao Phraya River, just south of the Taksin Bridge station. Just beyond the old houses used to be the river pier where early Chinese immigrants disembarked and took their first steps on firm ground after a long and hazardous sea journey in the mid 19th century. Later, the owners donated the land in Soi Wanglee to Wat Yannawa, a temple nearby. The temple then became the landlord and leased the buildings to the occupants. The descendants of some of the original tenants are still living there. The people in the area were known as the Wanglee community, after the family who built the buildings. This cosy arrangement ended in 2004, when Wat Yannawa filed a lawsuit to evict the residents. 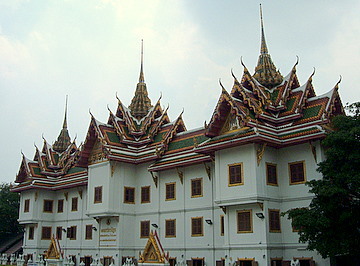 The temple wanted the land to be redeveloped into a commercial complex. Most of the residents accepted the compensation and left. But a few diehards resisted eviction and enlisted the help of a host of agencies to plead their case to preserve the buildings as a historical site. This case brings to mind several issues regarding temple community relations and the preservation of historical buildings in the face of modern development and commercial pressures. 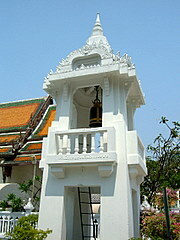 Traditionally, the relationship between temple and local communities in Thailand has been one of cordial coexistence. Many communities are clustered around the temple and the temple school. The temple provides for the spiritual needs of the people who in turn contribute to the basic material needs of the temple. In this case Wat Yannawa appears to be doing something detrimental to community interests for the sake commercial gain. The temple's action seems at odds with its religious mission. Even though the 81 year old buildings don't meet the 100 year criteria for historical sites set by the Department of Fine Arts, the area has a rich history. We're still destroying a cultural heritage. But preservation doesn't just mean leaving the buildings as they are. Preservation comes at a price. It entails restoring the old buildings and maintaining them. Who's going to foot the bill? What are the alternatives? It's unlikely the existing tenants can afford it. Unless we're prepared to preserve their traditional way of life and let the buildings go to rot over the years. Even if Wat Yannawa can afford it, the buildings when restored, in all fairness, must be for the benefit of the general community, not just the existing tenants. Private developers expect a return on their investments. Private ventures into such projects have been criticized for preserving the shell, the buildings and killing the soul, the old way of life. That's the social price to pay. If the original occupants were left intact, who would sink a single cent in the project? Landlords will be very reluctant to spend huge amounts on preservation when the rents for residential property are much less than that of commercial property. That leaves the government. Any government will be hard pressed to justify spending public funds to preserve buildings for private use. One way is to enact laws to preserve the exterior of historical buildings with internal use left to the developers’ discretion. Old buildings can be converted to small offices, shops, trendy restaurants, cafes and wine bars. The conclusion is inevitable. Unless the residents can pay for the preservation, they're going to lose their homes. There's a price to preserving our cultural heritage. It's a matter of how much we're willing to pay and how much to forgo. Someone's got to pay for it, but who? 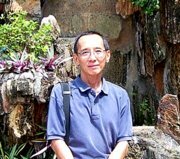 I visited Wat Yannawa on 3 March 2008 and passed Soi Wanglee. The old buildings have been completely leveled. The area is fenced off and used as a temporary parking lot for “song taeow” (red passenger pickups running regular routes) and “tuk tuk”. Time has run out for the Wanglee community. In developing cities, the old frequently has to make way for the new. Years later, we might well ask ourselves, where have all the old buildings gone? View Wat Yannawa in a larger map. Take the Silom line of the skytrain to the Taksin Bridge station and get out at the exit leading to Charoen Krung Road. Turn right at Charoen Krung Road and walk towards Charoen Krung Soi 52. Wat Yannawa is past this soi. 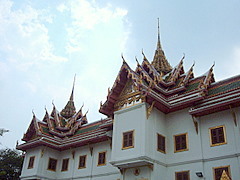 To return Bangkok temples and for more Bangkok photographs.